Bill and Tricia Moser were living in one of America’s wealthiest communities when they stepped away, launching a journey of faith that ultimately led them to become Old Order Amish—adopting the plain life exemplified by the horse and buggy. They and their six children remained Old Order Amish for 15 years, but in 2014 they left their community and joined an Amish-Mennonite church in Missouri. The Mosers’ new church adheres to the same Anabaptist statement of faith that all Amish and Mennonite churchs adhere to, but the Mosers have far fewer technology restrictions than when they were Amish. They now drive cars and use electricity. In a previous post, we asked Bill to discuss the greatest joys and benefits he found while living Old Order Amish. In this post we ask Bill to discuss some of the key challenges he and his family encountered. 1. The language barrier was very daunting. Bill Moser: Well, language would be a large and obvious challenge—not knowing the native Amish language, Pennsylvania German. But I would say that did not hinder us from becoming Amish, it hindered us from remaining Amish, though we did stay Old Order Amish for 15 years. We were willing to accept the challenge of the language when we joined. We initially figured we would learn Pennsylvania German, but at the time there were no good instruction books, and we just were not able to pick it up. I wonder, among the people who do remain Amish, how many marry an Amish spouse, because that would make a big difference in learning the language. Our church did, however, go to great lengths to help us, by having translators for us during church. And our community members spoke English with us in daily conversation. But having a language around you at all times that you cannot understand leaves you feeling something like an ex-pat and never fully assimilated, and that became an issue for us over time. 2. Crossing cultures is difficult—we underestimated the size of that challenge. Right. And the cultural piece more broadly—you could even call it an ethnic piece—is a challenge. You are living in a completely different culture and it’s a culture that is based on not changing. But one just naturally brings some artifacts from previous life into new life as Amish, and some things that seem innocuous to the seeker might be subtly discouraged by the community. It can be a very subtle thing, but it’s also a real thing. This example I’m about to give shows what I mean. Tricia had a collection of decorative teacups because her family’s ties go back to the British Isles and tea is a big deal in her family. So she displays the teacups on the wall. This sounds like nothing to somebody in general American culture, but in the Amish culture, that can be construed as a sign of pridefulness, and it would be subtly frowned upon. I think people moving into the Amish culture are generally aware they will be giving up the big cultural things, but what can surprise them or cause frustration is feeling that idea reach deeper into the small decisions they make as well. You do laundry on a Monday. You use a wringer washer. Pizza is made a certain way … lots of little things like that. 3. Many parts of living low on the technology scale are easier than we expected, but other parts are difficult in surprising ways. Coming into it we felt some challenges, yes. Changing the way we live, not having electricity and how that affects lighting and refrigeration would be the two main things. And of course the challenge of transportation. But initially it helps that you have the newness of it, the excitement of the challenge, you could say. Learning to drive horses was a bigger challenge than I’d expected, and to be honest, though we lived horse and buggy for 15 years, I never became fully comfortable driving horses. We had some runaways, a couple of accidents, but thankfully nobody was ever hurt badly. One unexpected challenge for me was navigating the relationship between myself and the drivers whom we would hire when we needed to travel or do errands that required cars. If you are not careful, the relationship can begin to feel like the driver is your chauffeur, or even like a servant, and that is a feeling that is very much against the Amish faith. 4. It’s important to fully grasp the Amish view of Jesus’s teachings. Living the faith can be a challenge for people from broader America. We embraced the Amish expression of Jesus’s teachings, but it is a different interpretation than mainstream religion. Many people would have a problem with nonviolence. Also, the idea of separation from general society—in the world but not of the world. The teachings of modesty … modest dress is especially difficult in today’s world. It would have been simpler a hundred years ago when most people dressed modestly and many mainstream churches encouraged a head-covering of some kind. 5. It’s difficult starting and nurturing a relationship with an Amish community—be prepared for that. Well, this is a little less tangible, but it’s very strong … not even sure how’d I’d put it. But, you might think it would be an easy thing to find an Amish group to join, to get to know them and join. But it is not an easy thing. Culturally you are different. That is no small thing. So the process begins when you get a connection and you strike up a relationship with one individual. You get to know them a bit better. And you begin getting to know more people in the community. And they have to process that, too. How are they going to respond to you. And then there’s the connection to church leadership. And it keeps broadening and eventually there’s a point of asking, “Can we join your church?” The whole processing of that is difficult, it is a hindrance in itself. You don’t just walk up to the church door one Sunday and say, “I’m going to join this church.” It’s like an intricate courting ritual for you and your family and for the people of the Amish community. 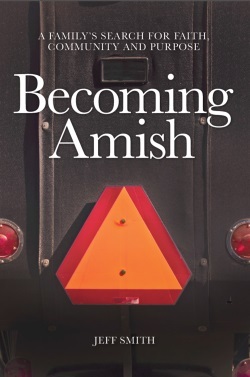 Bill Moser and Jeff Smith recently collaborated on a book titled Becoming Amish, about the Moser family journey. 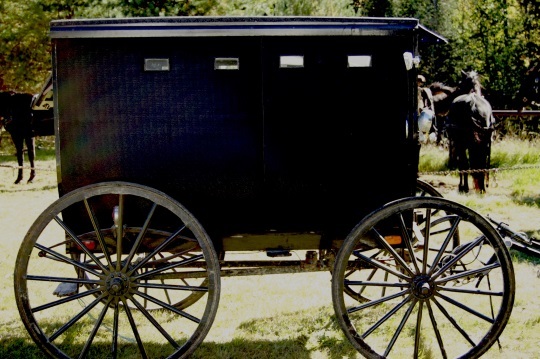 The book provides broader context to transitioning to Amish with interviews of Amish bishops to discuss the seeker experience, an interview with the minister who helped lead the Amish education Supreme Court case of 1972, exploration of the seminal Anabaptist book Martyr’s Mirror and visits to plain living communities to discuss technology and faith. Find the book and more at BecomingAmish.net or Amazon.com. Books on learning Pennsylvania German? Does this mean there are books on learning this now? Would anybody have any links or titles for these books? Bryan there is a book called Speaking Amish written by a Lancaster Amish-raised woman. I think it could be a good resource to get you started in the Lancaster County version of the language. Thanks Erik! Just had a look at the link, looks good! I used to live in MO, pretty near Clark and once in a while give rides into town to a family I got friendly with. Long story short, later on I ended up living in Germany for a while, learned a bit of German, and now have a German wife. We’re moving back to MO and I’m quite curious to see how much I can pick up of the PA Dutch. Great website here! Appreciate the newsletter. Thanks Bryan! I hope it goes well for you. If you have an interest in the language there is a new book by Mark Louden called Pennsylvania Dutch: The Story of an American Language. I’ve enjoyed it so far. He describes one area in Germany where the German spoken is most similar to PA Dutch (though the premise is that PA Dutch is separate enough that it is a different language, not just a dialect). Also here is a series of excellent Youtube videos that can set you on your way learning Penn Dutch. Doug Madenford is a great teacher. Thanks Judith for sharing that link, I have spent some time with those, I agree it is a really nice resource Doug put together. I can imagine the challenge it takes to overcome the differences in a cultural group. I was raised a minority Anglo in a Mexican world, then moved to a mostly Anglo farming community that was so different it was a shock. Thankfully I had many families who were related and who knew me and my family that we weren’t held apart as much as true newcomers would be. When I was a young adult I could see myself easily becoming Amish but I’m too old for that now…I appreciate my creature comforts.. When I was a young searcher I traveled the country visiting monasteries. Joining a monastery is not that different than joining the Amish. Some similar factors are: isolation from the dominant culture, very regimented daily life, a singular and strict belief system, simplicity, meekness, god centered, community centered, etc., etc. In a sense, to become a monk is to give over your life in total, just as becoming Amish is an all-encompassing change which is largely unrealistic for most of us. Not realistic, and more importantly, probably not ‘your calling’. Very few can flourish within monasticism, and from my reading becoming Amish probably has a similar failure rate. You may be attracted to ‘the life’, but what exactly is the attraction, what bits and pieces of the total are truly calling you? This type of life commitment needs careful, very careful, self-examination. I would think a few years of extensive cross-examination via whatever type of soul searching techniques you have at hand is just a starting point: reading extensively, visiting, short stays, looking at all the alternatives, etc. If you are being honest to the bone/soul with yourself you will begin to detect subtle shifts, very fine levels of dissonance in your feelings, thoughts, emotions which you must attended to as sign posts. These are very subtle indeed, and can easily be ignored by an ego which wants to jump into a life change or otherwise is impatient for change. The more adept you become at ‘mining’ out these very quiet murmurings, discerning their meaning, and bring them to the fore of your rational mind, the more direct and true to your spirit your life direction will take. What you need is within, and not out there someplace. Community is very important of course, and the ‘problem’ with our dominant culture is that we feel incapable of remolding it, especially in today’s gridlocked political climate. Regardless – without first understanding the subtle murmurings of our inner selves, a still small voice which is trying to speak to us – then we can neither know where to go nor will we know what to change in our lives to create an inner resonance instead of a constant feeling of social-cultural dissonance. The mistake early on that I made was believing my well intentioned ego was actually my spirit/soul directing my efforts. This is a subtle distinction that a novice may not recognize. In order for us to have free will the spirit does not direct, and is far too easily ignored or not heard, being drowned out by a seemingly well intentioned strong personal will/ego. The deeper you go the more the problem becomes determining relative good, not the crud distinction of bad versus good, and relative good can be as misleading as evil itself to a soul which is far from finding its center – its home on this earth. Sorry for the truism, but if one is centered then one is at home everywhere, and then, may be in a ‘place’ to know the right place. I was very impressed with how well-written and well thought out this response was. It mirrored my own wishes and desires over the years to “become Amish”, “become a nun”, become “something” more holy, more good, more like Christ. I have finally come to the wisdom that God calls us where we are. There were no convents in the New Testament. Even though it says that they “had all things in common”, there does not seem to be any indication that this was all-encompassing. I am not against convents or being a nun or monk, but I do feel that just as much good can be accomplished by individuals just living an ordinary life. The allure of joining a “community” is very strong, but it doesn’t make us any holier or more Christ-like”. Only Christ can do that. I read the book about the Mosers, and felt that it was exceptionally well done. Concerning the language problem, I kept wondering how the Mosers’ spiritual pilgrimage would have turned out if they had joined one of the Brethren horse-and-buggy churches, where English is the language spoken and there are many converts. I am not aware of any horse-and-buggy Brethren in Michigan. When you write “Old Order German Baptists,” are you thinking of the car-driving Old German Baptists? The Old Order German Baptists (Petitioners) are a separate denomination. There is another horse and buggy Old Order Brethren group: the Old Brethren German Baptist. They speak English only and live in Indiana and Missouri. Concerning the German language: As far as I know, there is no course book with which you can learn more than the first steps to Pennsylvania German. To improve my Pennsylvania German I read “Di Heilich Shrift – Pennsylvania Deitsh un English” i.e. a bilingual Bible. Knowing Standard German helps a lot to understand Pennsylvania German. An option is to go to Germany for one year and learn Standard German and then try Penn Dutch. The Virginia Old Order Mennonites are in many aspects like Old Order Amish but speak English only! The Amish in Unity, Maine are more open to outsiders. This is also true for the Noah Hoover Old Order Mennonites who are in many aspects more Amish than most Amish. Caneyville Christian Community is another option. By the way, Standard German is my mothertongue and I understand almost all Pennsilvania Dutch if it is spoken loud and clearly as e.g. Amish sermons. I can also speak it to some extend and normaly people understand me, but my Pennsilvania Dutch is far from being perfect. The Virginia Old Order Mennonites differ significantly from the Old Order Amish in that the Mennonites use motorized equipment and now all three groups of them use “public power.” Of course, they also use English, although a few of them are fluent in Deitch. First Time Hollywood Depicted Amish People? I thought you might like this. I stumbled on what might be the first depiction of the Amish in a Hollywood movie. A movie called Violent Saturday from 1955. Go to 5:23 in the film to see the Amish. I should add that in the link to the 1955 film Violent Saturday posted above, the Amish appear in the film multiple times, including at 25:57. Amusing that the film “Amish” use Thee and Thou and Wilt thou; all English derivative words rather than German or Pennsylvania Dutch words. I guess Hollywood not doing any research on a subject before portraying it on film is nothing new. Somehow just by studying the Amish and reading this blog – I knew that wouldn’t fly having tea cups up on a wall as a decoration. Plain people are called plain for a reason. I really liked this article! Thanks for posting it. Glad you liked it Judith, I thought they did a great job with it. Interestingly, in some (or many) churches that may be the case, though in others you might be surprised – Amish do have fine china in some communities and decor can vary. 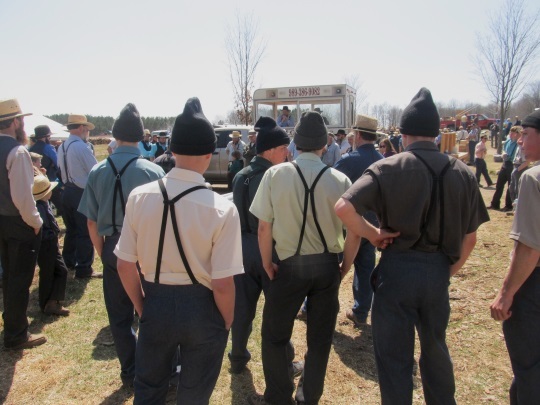 How do Amish keep frozen food?